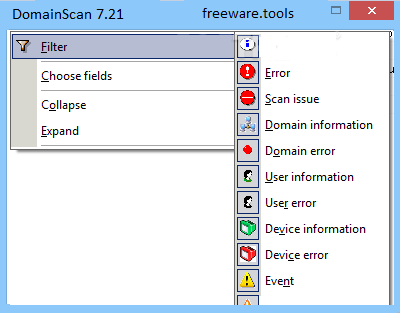 DomainScan is a non-intrusive and real-time network monitoring application with a suite of built-in tools, which makes DomainScan a unique and very useful tool for network monitoring and support tasks. This network monitor tracks computers and users in real time. DomainScan also works as an audit and logging tool, which makes it a useful tool for system administrators and support personnel. Tools include a WMI browser, network search tools, domain report, port test and a hardware browser. Everything is presented in an easy-to-learn user interface, and because of the fact that DomainScan is using existing network technologies, no client software needs installing. More often than not, knowing what is going on with your network and servers at all times is one way to avoid disaster. DomainScan is an application designed for schools and businesses that need to keep a close eye over the devices connected to the network as well as the users' activities. After a swift and uneventful installation, you need to take a couple of minutes to configure your network and server. While it may sound like an advanced task, you will be happy to learn that the app comes with a wizard that can guide you through the process. Moreover, since the app automatically detects what is not configured, your job entails specifying a handful of missing details. You should bear in mind that the utility can take a few minutes to perform the first scan, an operation that is mainly influenced by the size of the network, average number of active users and devices connected. The data is displayed neatly in a dashboard along with any modifications made in real time. Depending on your needs and preferences, the program comes with a reliable filter system that enables you to preview just the information you are interested in. Therefore, you can immediately learn whether there have been user, device or other types of errors following an infrastructure or software update, for example. It is worth mentioning that the program can also generate reports in an HTML format. In fact, the app can provide you with simple user and devices reports or more comprehensive summaries that can be employed for analysis and better management purposes. Whether you are looking for a simpler way to assign tasks in your classroom or perhaps are running a company network that relies on an excellent uptime, DomainScan can come in handy.